President Muhammadu Buhari speaks while inaugurating a project in Jigawa State on May 14, 2018. President Muhammadu Buhari on Monday in Jigawa State declared that Nigeria’s agricultural revolution is real and on course. The President also assured Nigerians that his administration would sustain the positive momentum in the sector by implementing the right policies. He gave the assurance an event to mark the commencement of the rehabilitation and expansion of the 6,000-hectare Hadejia Valley irrigation project in Jigawa. President Buhari, who is in the state on a two-day working visit, promised that the government would provide the needed financial resources for people-oriented projects in the sector. He was happy that the economic diversification and inclusive growth programmes of his administration were already yielding positive results, particularly in key food-producing states. The President further applauded the World Bank’s assistance to the project, which when completed would increase water availability for all-season farming in Jigawa and beyond. On his part, the Minister of Water Resources, Suleiman Adamu, said works on the first phase of the project which started in the early eighties during the administration of President Shehu Shagari and received some funding under the Petroleum Special Trust Fund had suffered frequent abandonment due to lack of funds. Adamu, however, revealed that with N9.6 billion allocated under the $495 million World Bank-assisted Transforming Irrigation Management in Nigeria (TRIMING) project in five different irrigation locations in the country, the project would be completed by 2021. “By the time the project is finished in three years, there would be about 6,000 hectares of farmland and the Jigawa State Government also plans to key into the project that will benefit over 25,000 farmers,” the Minister explained. 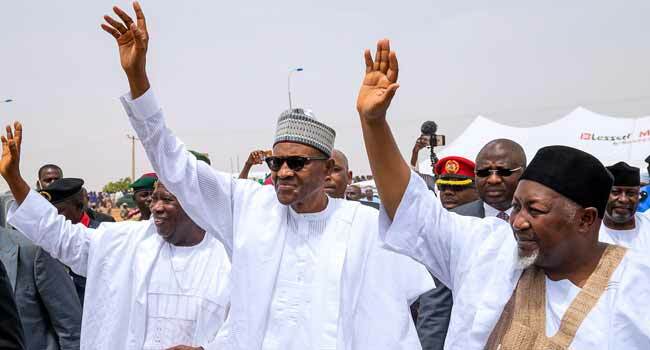 Following his arrival in Jigawa earlier in the day, President Buhari inaugurated the 42-kilometre Tasheguwa-Guri Road and the 32-kilometre Abunabo-Kadira-Guri road constructed by the state government to make the movement and evacuation of farm produce convenient for the people. He also inaugurated the 250,000 solar-powered water supply scheme in the state. According to a statement by the Senior Special Assistant to the President on Media and Publicity, the project is one out of nine of such projects which will add nine million litres to daily water supply in Dutse and its environs.